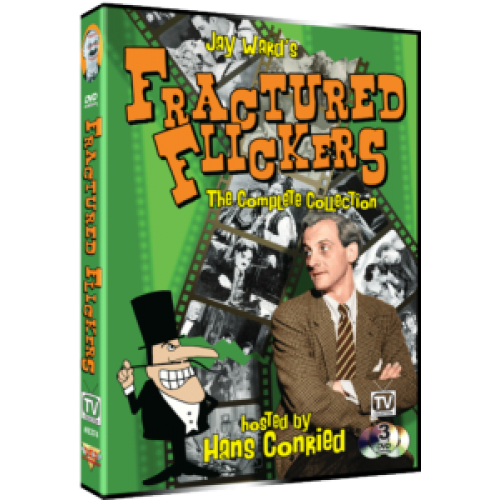 Produced in 1963 for TV syndication via Desilu, Fractured Flickers was an irreverent tribute to silent pictures and the special creation of Jay Ward and Bill Scott, the comic genius behind Rocky & Bullwinkle and many other TV cartoon characters. Using silent film clips featuring great old stars like Douglas Fairbanks, Stan Laurel, Houdini, Harry Langdon, Lon Chaney and Ben Turpin, and mixing in old newsreel footage with some zany plot lines, each episode became an entertaining conglomeration of comedy and mayhem. (If you're a fan of movies like What's Up Tiger Lily? or Kung Pow: Enter the Fist then you'll be in complete laugh-out-loud stitches by the end of this series!) Each show also featured a special Guest Star interview, with the likes of Fabian, Rose Marie, Connie Stevens, Rod Serling, Bullwinkle J. Moose, Barbara Eden, Bob Denver, Ursula Andress, Bob Newhart and many more making an appearance. The series was also blessed with a great staff of writers, with lots of comedy experience – The Rocky & Bullwinkle Show, Get Smart and Mary Tyler Moore – to name just a few. Our special collection contains the entire series of 26 half-hour episodes on 3 dual layer DVDs.